I’m pumped for Halloween this year. If you’re anything like me then you love to plan parties! I love getting creative with my DIYs and really trying to stretch a dollar. Today I want to show you 6 Easy Halloween Party Ideas that I made myself. They all turned out adorable and they were all so easy to make. I made most of these ideas using my Cricut along with some to die for Halloween files from Makers Gonna Learn. It’s a membership website that was created for die cutting lovers like you. It’s filled with over 400 Digital Cut files for your machine, perfect for every occasion. Go check it out! I Hope you enjoy these great DIY Halloween Party Ideas! These little buckets make the perfect party favors. I grabbed these from my local dollar store and added the cutest flamingo skeleton file from Makers Gonna Learn. It was an easy vinyl project perfect for Cricut Beginners. You can fill these buckets with whatever you’d like. 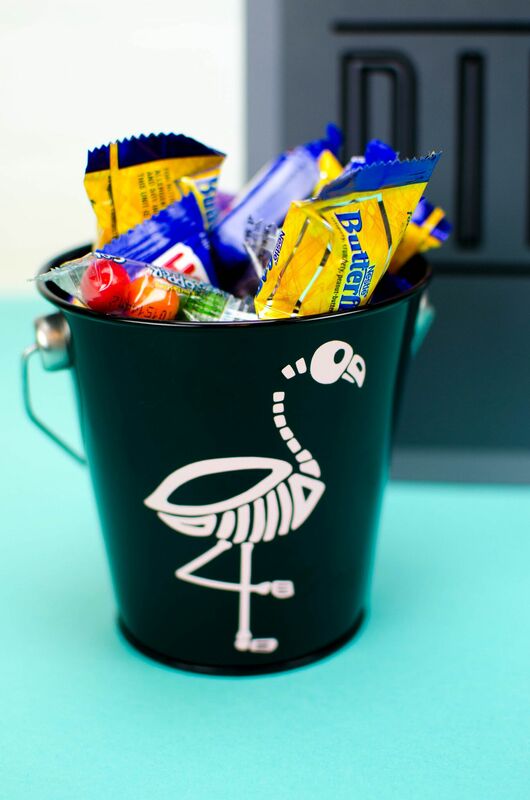 We loved the idea of giving everyone their own bucket of candy. 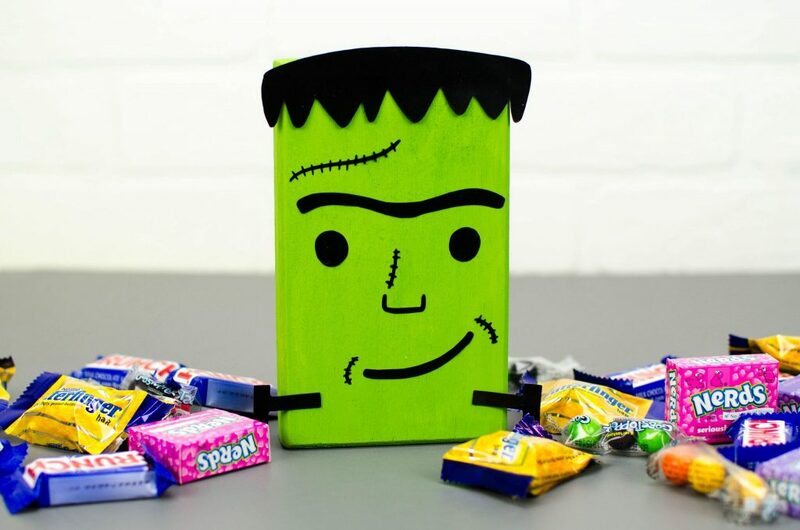 This little Frankenstein decor was so simple to make! If you have any scrap wood lying around then you could make this project at no cost! With Makers Gonna Learn, all you do is let your die cutting machine cut out the facial features and just glue them on your painted piece of wood. This is a great decor piece to make last minute! These little notebooks were a huge hit at the party. I found these guys for less than a dollar each and simply added some more vinyl decals. 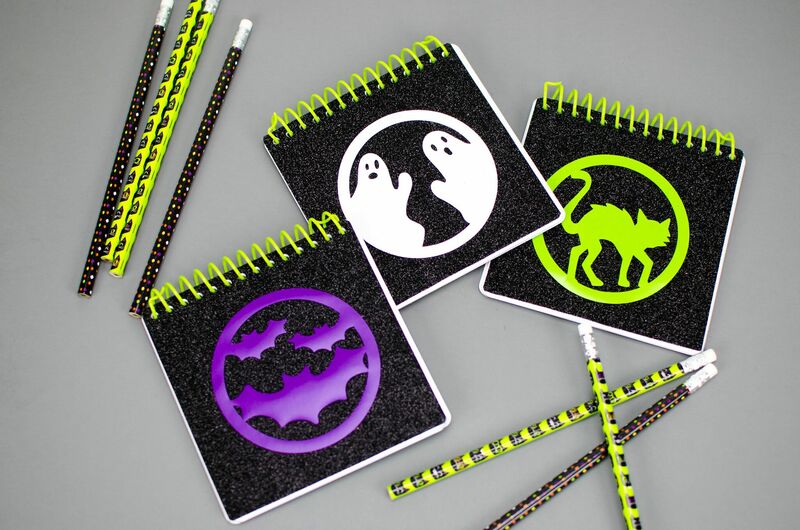 Paired with cute Halloween pencils, they made the perfect alternative Halloween gift. Some kids can’t have candy, so it’s always a great idea to have things like this to accommodate them. These little guys were so fun to make! It only requires a few supplies and you can get as creative as you want with what you fill them with! Sparkles, confetti, candy, plastic bugs, whatever you’d like. Everyone thought they were so cute, and I loved making them. This file from Makers Gonna Learn is too cute! I knew I wanted to make something with it this year. 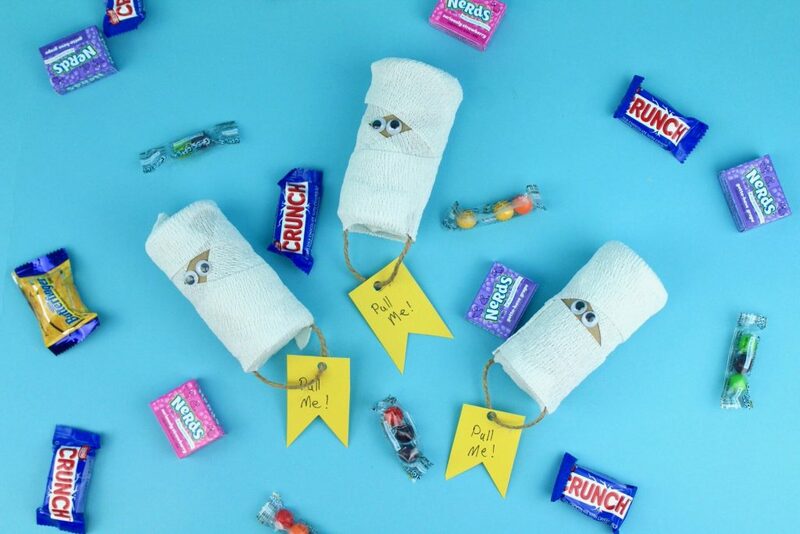 I decided to make a fun trick or treat bag as one of our party game prizes! Making your own trick or treat bag also means you can make it as big as you’d like to hold as much candy as you’d like! This project was made with Cricut Iron-On and our beloved EasyPress. It took less than 10 minutes to finish! 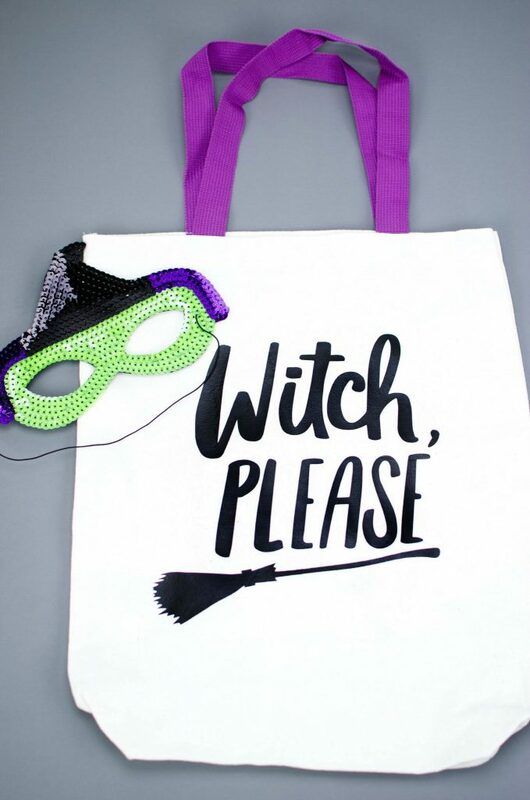 Just like our witch bag, we made this shirt with Cricut Iron-On and our EasyPress! It turned out so cute, and I loved wearing it on Halloween. 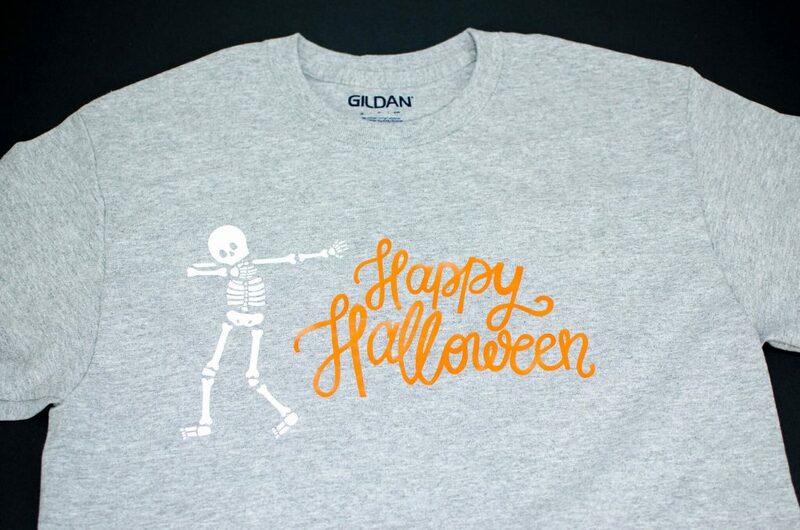 Now that I’m older I don’t wear costumes as much, but I can still get into the Halloween spirit by creating and wearing a cute DIY shirt like this.